Ticket includes admission into the festival. PRICES INCREASE ON JAN 14th! Ticket includes admission into the festival. PRICES INCREASE ON FEB 9th! Includes 4 admission tickets for only $45 ($15 in savings!) PRICES INCREASE ON FEB 9th SO HURRY! The biggest annual winter festival in Delaware County returns on Saturday, February 9th, 2019 to Barnaby's Ridley & The Heritage Ballrooms! The areas top cover bands, best DJ’s & cheap drink specials will all be taking place from from Noon-2AM. 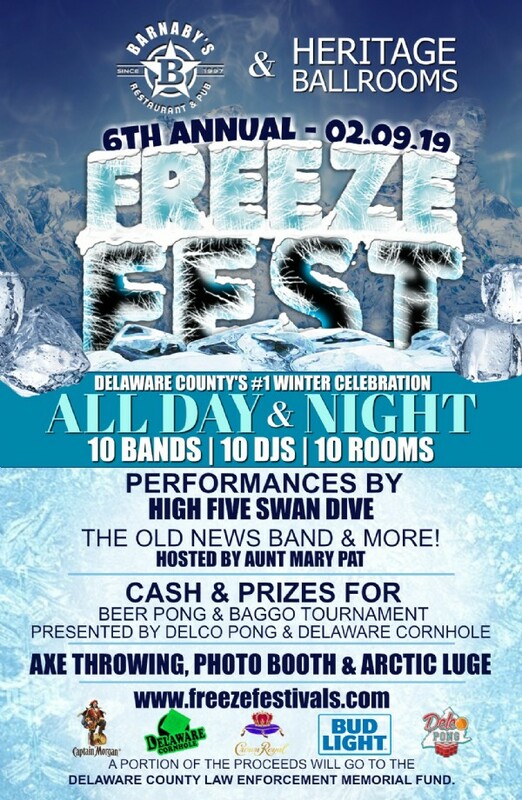 Freezefest™ '19 takes place in Barnaby’s 30,000 sq ft indoor/outdoor facility and will feature live bands & acts, 10 DJ's, 10 themed rooms, giant arctic ice luge, axe throwing, food court, silent Philly Headphone Party, photo booth, custom heated tents, 3 giant ballrooms, the east coasts biggest beer pong & baggo tournament, costume contest, giveaways, great drink specials & much, much more! High Five Swan Dive, the house band for The OD in Sea Isle City NJ headlines the festivities at night & the legendary Old News Band will perform a special guest set during the day to benefit our men & women in blue for our charity sponsors. Aunt Mary Pat will host the day party with an hour filled with comedy and Delco laughs! 10+ of the area’s best DJ’s & live entertainers will round out this star studded event lineup! - The Old News Band, HaHa Charade and Elena Brokus Productions Future Stars will headline our police fundraiser starting at 4PM inside the Heritage Ballrooms with proceeds going to Vest-A-Cop, Delaware County Law Enforcement Memorial Fund and the Trauma Survivors Foundation. View More Events Organized by Resolve Marketing & Consulting. Resolve Marketing & Consulting - events & crawls. This event is organized by Resolve Marketing & Consulting.